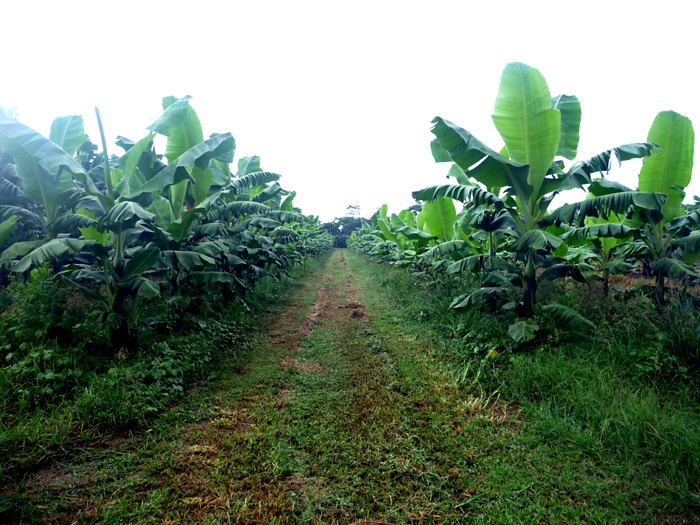 Improved management practices in bananas have reduced the cost of fertiliser application. In addition, grassed inter-rows have reduced the loss of water and sediment. 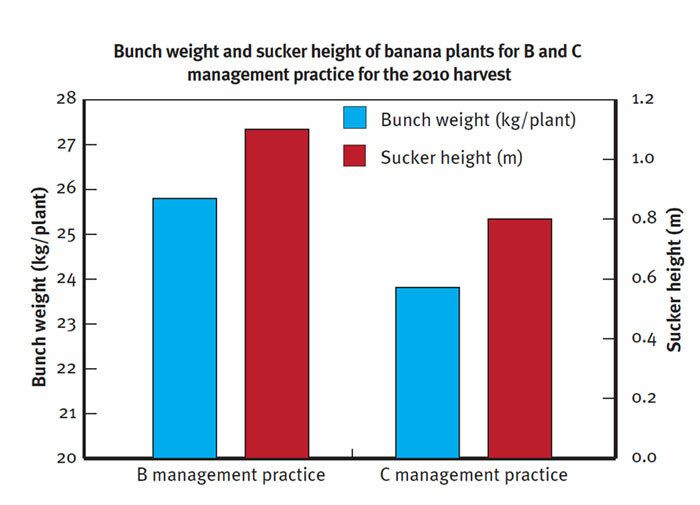 The reduced rate and more frequent application of nitrogen under B class management practice produced similar yield, fruit characteristics and ‘follower' sucker growth to that achieved under conventional management. These lower rates of fertiliser application have already been adopted on commercial plantations by some growers without affecting productivity. B class practice, February 2010. Photographer: John Armour, Department of Natural Resources and Mines. C class practice, February 2010. Photographer: John Armour, Department of Natural Resources and Mines. The cost of nitrogen fertiliser was $220 per hectare for the B class management practice and $365 per hectare for the C class management practice, a saving of $145 per hectare for the plant crop. In addition, by using fertigation, the B class practice also reduced the application cost by omitting one pass of a tractor and fertiliser spreader each month. The photographs below were taken minutes apart during a rainfall event in February 2010 before the installation of monitoring equipment was completed. They clearly demonstrate the difference grassed inter-rows make. The B class management practice, with the grassed inter-rows, has no water and sediment movement in contrast to the high (unquantified) sediment load in runoff from bare inter-rows of the C class management practice. 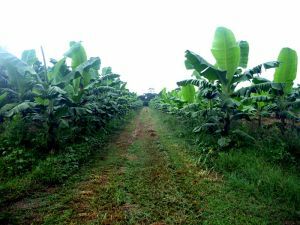 However, the grassed inter-rows are difficult to maintain in ratoon crops because of constant traffic and increased shading. The Paddock to Reef program will continue to measure runoff, sediment and water quality resulting from these two treatments, and gather more information on the productivity and economics of the B and C management practices. 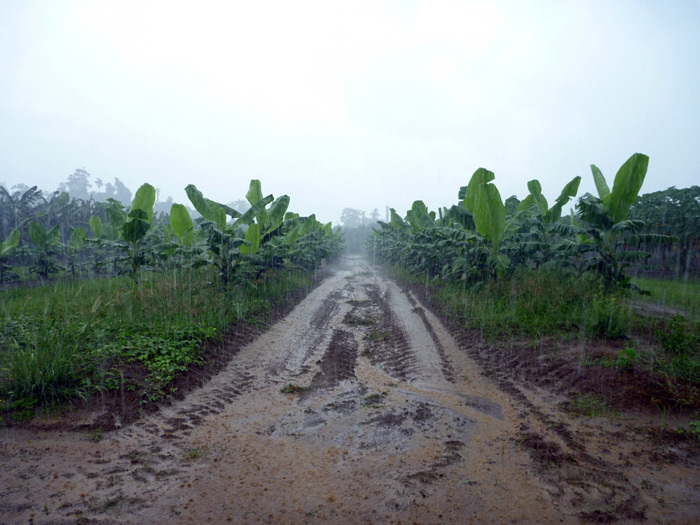 For further information on improved banana management practices, see the Monitoring nitrogen losses from bananas in the Wet Tropics region case study.